Successfully Added DVR Camera Lighter to your Shopping Cart. Bringing you the coolest surveillance gadget in the form of a robust DVR lighter, this style hidden video camera comes with a micro lens that lets you capture secret footage that no one will ever know anything about! This Camera Lighter is built with an all metal body with an embossed Egyptian pharaoh image to give the lighters' brushed metal finish an extra touch of authenticity. This is the perfect gadget that makes a great toy for yourself as well as a nice gift for any good buddy. 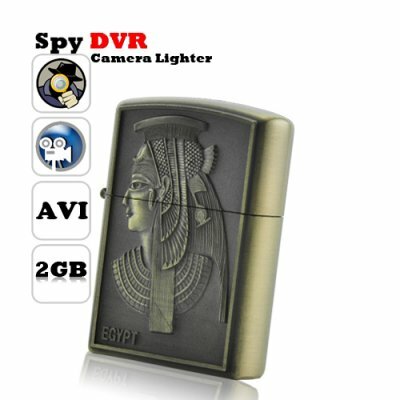 This DVR Camera Lighter is simply cool and fun whether you are using it for ing or recording you and your partner having some fun together! This DVR Camera Lighter records both audio & video as well as capturing still images, and comes with a true 1.3MP for a clear video recording. After you've recorded your footage, simply connect this DVR camera lighter to your computer using the included USB cable. This plug & play gadget requires no driver installation whatsoever, instantly access the DVR camera lighters micro SD card to play back the recorded computer friendly AVI footage. In stock in our warehouse right now, so order yours today and we'll express ship you a sample straight away! Then later on you can order it in bulk for resale and make a killing on unbeatable bulk discount price that allows you to have a healthy retail mark-up. This awesome gadget is only available from the leader in factory direct wholesale electronics, Chinavasion. Wow, a camera lighter with an embossed Egyptian pharaoh, who exactly is the pharaoh? It's a mystery, buy one today, and leave a review of who you think the pharaoh is. Can this DVR lighter also work as a regular Zippo like lighter? Due to the internal electronic components, it is not possible to use this Zippo style lighter as an actual cigarette lighter.